It's another Mask Monday! Lately, we've been reviewing a lot of sheet masks, so I thought we should switch things up a bit and review something different for a change. This Mask Monday I want to share with you all a wash-off mask review. 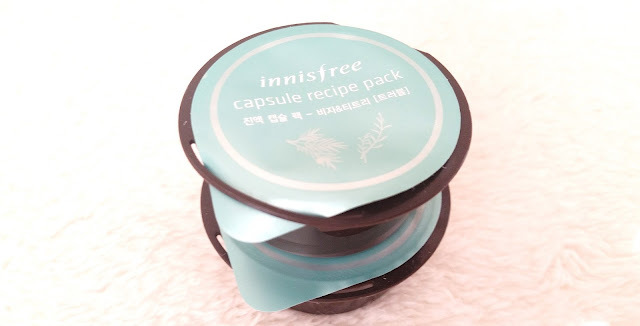 Specifically, this Bija & Tea Tree Capsule Recipe Pack from Innisfree. 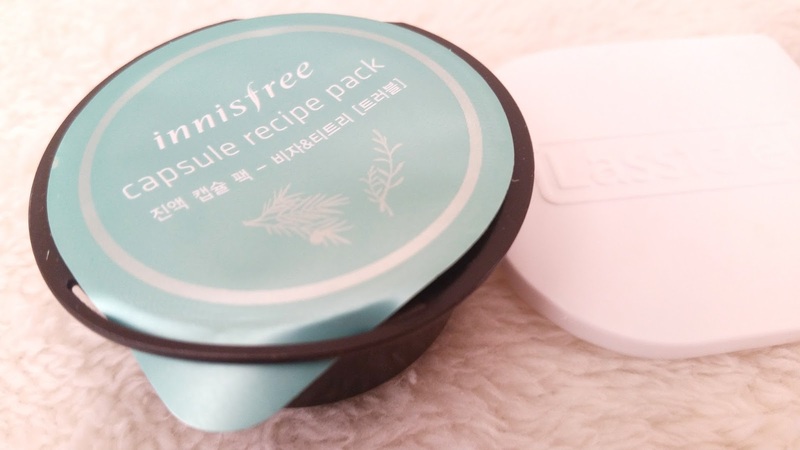 I've reviewed quite a lot of Innisfree's Capsule Recipe Packs in the past, some I loved and some not so much. 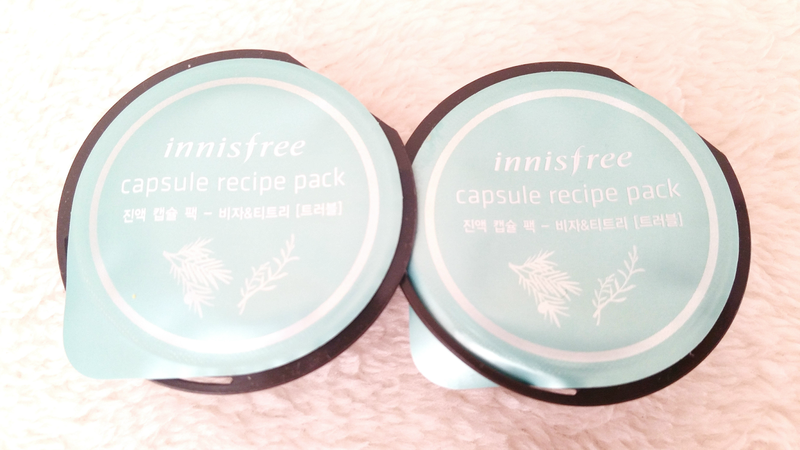 I recently found out Innisfree changed their Capsule Recipe Pack line. They changed the packaging, product formulations, and they've added/subtracted mask 'flavors'. I haven't looked at every new Capsule Recipe Pack in details yet, but I did check out and compare the new and old Bija & Tea Tree Pack. It would seem that the new version has more ingredients and some of the ingredients has shifted positions on the list compared to the old version. Today's review is based on the old version, which you can still buy at certain shops. Let's get to know it. 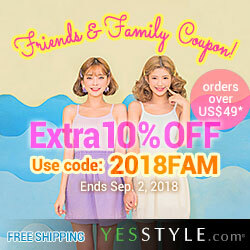 Product Description: A wash-off mask formulated with Jeju Bija and Tea Tree to relieve skin troubles. The Capsule Recipe pack can also replenish moisture to the skin and provide nourishment. The Bija & Tea Tree pack is a clay mask that can soothe and smooth the skin while enhancing its natural defense barrier. To Use: Cleanse the skin first. Apply the mask onto dry skin and leave it on for 10 to 15 minutes (or just before it dries). Rinse off with lukewarm water and continue on with the rest of your skincare routine. Ingredients: WATER, AMARANTHUS CAUDATUS SEED EXTRACT, CENTELLA ASIATICA EXTRACT, FICUS CARICA (FIG) FRUIT EXTRACT, CITRUS UNSHIU PEEL EXTRACT, ORCHID EXTRACT, CAMELLIA SINENSIS LEAF EXTRACT, CAMELLIA JAPONICA LEAF EXTRACT, OPUNTIA COCCINELLIFERA FRUIT EXTRACT, CITRUS MEDICA LIMONUM (LEMON) PEEL OIL, MELALEUCA ALTERNIFOLIA (TEA TREE) LEAF OIL, KAOLIN, HYDROGENATED LECITHIN, SODIUM HYALURONATE, 1,2-HEXANEDIOL, XANTHAN GUM, CHROMIUM OXIDE THE GREENS (CI 77288), ETHYLHEXYLGLYCERIN, TORREYA NUCIFERA SEED OIL, CERAMIDE 3, PHENOXYETHANOL, TITANIUM DIOXIDE (CI 77891), BENTONITE, IRON OXIDES (CI 77499), PROPYLENE GLYCOL,BETAINE, BUTYLENE GLYCOL, ALCOHOL, TITANIUM DIOXIDE (CI 77891), ULMUS DAVIDIANA ROOT EXTRACT. Packaging: Stored in mini capsules, each recipe pack is good for up to 5 or 6 uses (more or less depending on how much one uses per application). The recipe pack has a simple packaging design with minimal information about the product on the pack. Although slits are built into the packs for resealing purposes, personally I don't think it works well. Each Capsule Recipe Pack 'flavor' has its own color theme that differentiates them from the others. The Bija & Tea Tree pack has a color close to Tiffany blue. 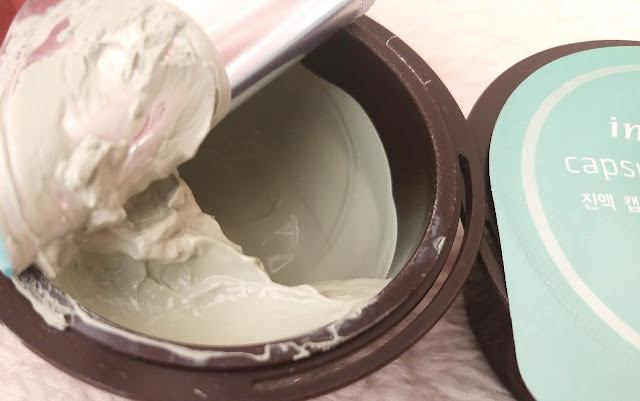 Color: The clay mask itself is green-ish gray in color. Scent: This pack has a fairly strong scent. It smells very herbal and I can pick up bija and Tea Tree scents easily. 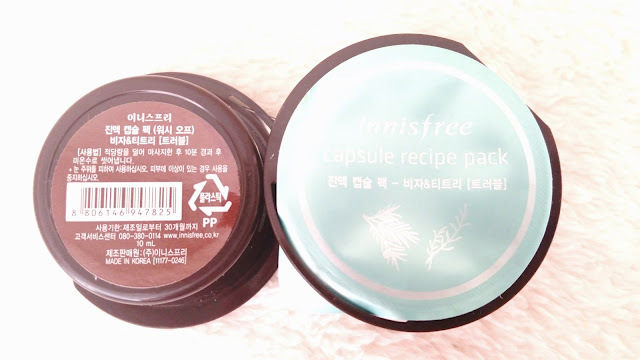 Texture: The texture of this mask is very similar to Innisfree's Super Volcanic Clay mask. It has that typical clay mask texture. Michelle's Thoughts: I have a love-hate relationship with this Bija & Tea Tree Capsule Recipe Pack, although it's mostly love. The dislikes are more personal preferences, like scents for example. While I don't mind herbal scents, I found the herbal scent from these packs to be way too strong. It's almost headache-inducing, which isn't what I want. The other dislike is not a big issue, as I've found ways around it, but it's still a flaw and that is the reseal technology. It shouldn't really be called technology because it's really just a slit where you insert the mask pack flap (see image above). However, as I've mentioned in all of my previous Capsule Recipe Pack reviews, this reseal idea does not work. I just always use a different lid to keep the flap shut. I found an opened capsule can last about 2 weeks before it starts to dry (if you keep it resealed properly). Although I do recommend to use it as soon as possible. I patch tested this mask as I would with other masks. It's a good thing each pack can be used multiple times. The clay mask passed my patch test without much of an issue (the only issue being the scent), so I went on to full face tests. The clay mask claims to relieve skin troubles, replenish moisture & nourishment, soothe the skin, and smooth the skin. Did it do all that? Well, almost. I would say it's not perfect with relieving skin troubles, but it did help. 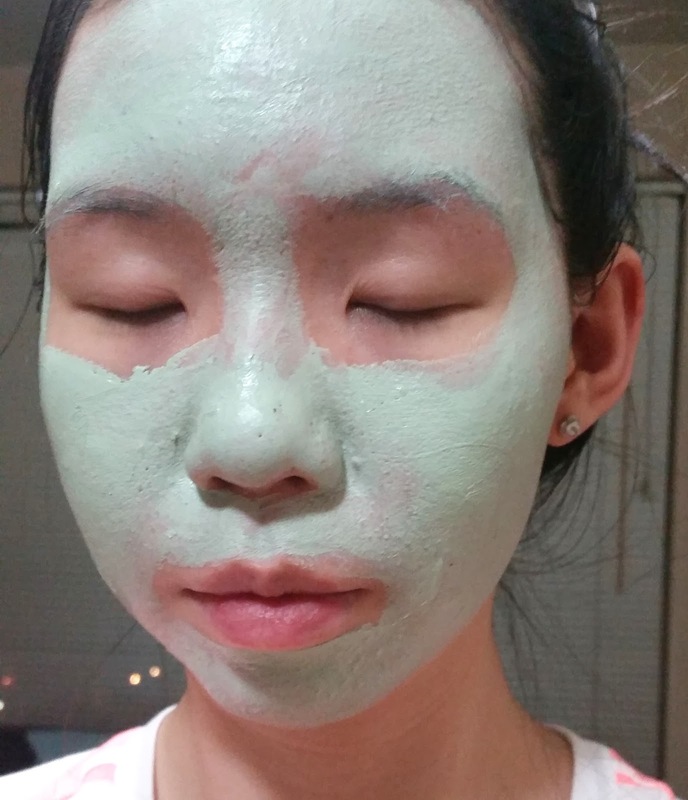 The clay mask was able to calm my skin and reduce some small acne, although it didn't do much for the large pimple I had next to my nose. Although this is a clay mask, it didn't feel drying at all, even after I washed it off, it left my skin nice and smooth. I don't think it's a particularly super moisturizing mask, but I didn't get that dry feeling other clay masks leave behind. The mask did feel soothing on my skin but the scent was not soothing at all. My skin did look clearer after multiple uses and the mask was able to calm the redness as well. It's been a while since I've shared a mask selfie huh? Final Thoughts: Despite the cons, I still like this clay mask enough to finish all the recipe packs I purchased. I still want to try the new version too. Hopefully, its scents won't be as strong as this one and it'll do more with caring for skin troubles. I think Innisfree should make larger versions of their Capsule Recipe Packs too. So when someone find the pack they like a lot, they can just buy the large versions. It'll be more eco-friendly, than buying a dozen small plastic packs. Would I repurchase this in the future? As it stands, this version of the line has been discontinued. While some shops still carries it, I imagine it'll be gone soon. I would like to try the newer version and see how it differs from this one though. Do I think this is worth a try. I think so. It does offer some nice skincare benefits and it's inexpensive as well. Plus, there are plenty of Capsule Recipe choices, you are bound to find something to care for your skin. personally, I prefer products without added fragrance cuz they they over do it sometimes.